Home » 16th Annual NHCC Awards Banquet » 2017 All-State Banquet Wrap-up! This past Friday evening, the NH Cross Country Community gathered to celebrate the 2017 season. Organized by the incomparable Larry Martin, since 2001 the banquet celebrates the top 10 in each division, a total of 60 athletes. 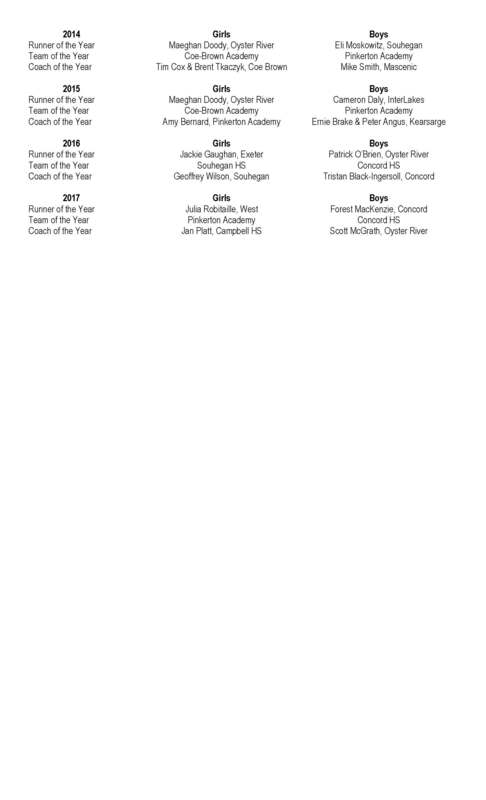 While the All-Division teams have been known for a couple weeks, also revealed was the All-State team (Top 10 in the entire state regardless of school size), Runners of the Year, Teams of the Year and Coaches of the Year. Honorees and guests are treated to Larry’s unique speeches about each athlete sharing many laughs and memories. Below is a complete history of the major awards given! Once again a huge thank you to John Mortimer and Millennium Running for their continued sponsorship! Congratulations to all! Congratulations to all the teams, individuals and coaches honored last night at the banquet. Like Larry says, you have to be the best of the best to be honored at the NHCCCA banquet. This ain’t soccer! 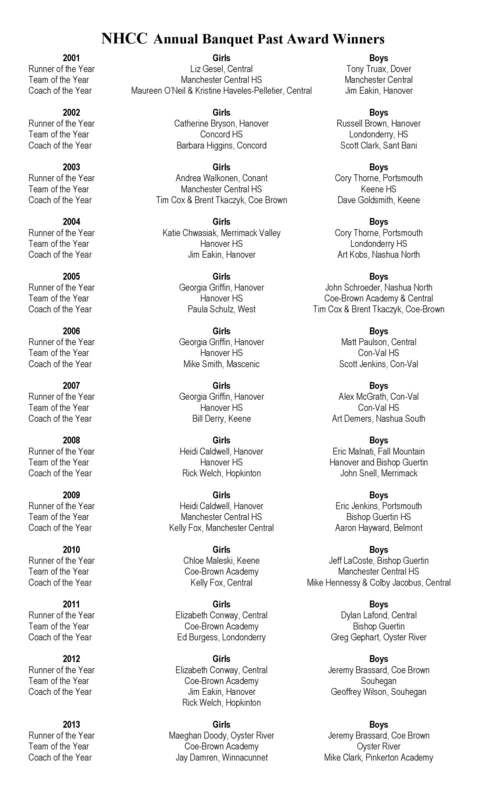 Congrats to Pinkerton and Concord for Team of the Year, Jan Platt and Scott McGrath for Coaches of the year and Forest MacKenzie and Julia Robatialle for Runner of the Year. And congrats to Julia for her performance today at NXN and showing how we do it here in the 603! Previous post 2017 New Hampshire Cross Country Highlight Video! Next post Robitaille Places 13th!!! 2017 NXN Diary and Webcast Replay – UPDATED!!! !